Imagine the wonders you would find as you descended below the surface. 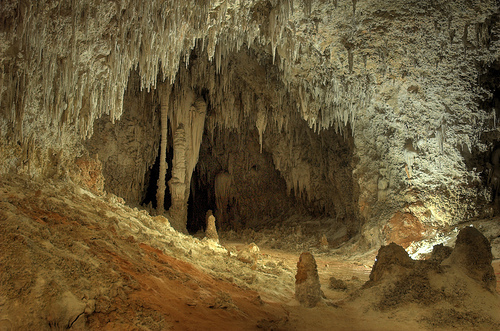 This is a scene from inside the famous Carlsbad Caverns in New Mexico. Imagine that you and some of your friends have been given the year off school to carry out an incredible project. Equipped with spades, pickaxes, drills, lights, ladders, and any other tools you may need, your task is simple: to dig the deepest hole you possibly can. Where will you choose to dig? What will you find as you gradually descend – gold, oil, dinosaur bones? And how deep will you be able to go? Given enough time and help, could you make a hole all the way through to the other side of the world? Many stories have been written about explorers who ventured beneath the Earth's surface. One famous tale is Journey to the Center of the Earth, written more than a century ago by the French author Jules Verne. It tells how three men – Professor Otto Lidenbrock and his nephew Axel, both German, along with their Icelandic guide Hans – descend into the crater of an inactive volcano. Inside, they find a passage that leads deep underground. Verne had a fantastic imagination. His tale told of a great sea, living dinosaurs, and even a race of primitive people that lived far below the surface of our planet. Today, we know that, even though such things do not exist, the interior of the Earth really is a remarkable place. Much of what has been learned about conditions far underground has come from experiments carried out on the surface. Valuable information has been gained by studying the way earthquake waves bend as they pass through various layers inside the Earth. Scientists have also sampled rock that has recently welled up from inside the planet through volcanoes and deep cracks. Unlike Verne's explorers, though, we have not yet gone far underground. So, could you ever dig a hole to China? In what follows, we shall look at the efforts that have been made to penetrate the Earth, and at the problems deeper drilling projects will encounter in the years to come. We shall consider, too, the challenge a future expedition might face if it were to bore a path right through the middle of the world and out the other side. 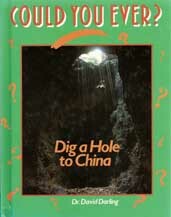 Could Your Ever Dig a Hole To China?